SQLite Workbench is a full SQLite editor which allows you to create, edit and manage your SQLite databases. It also allows you to export data or access it through remote REST API call, giving you a full database cloud based on SQLite. No more need to use desktop software to modify tables, add/edit/remove data or setup database preferences. SQLite Workbench allows you to directly run queries using TSQL, saving your preferences (like cache, journal mode, etc...), use foreign keys and managing them via simple diagrams and also connect your app using simple REST API. SQLite Workbench is also FREE! Register now and check all features! Main problem most users find using SQLite is often there is no actual GUI to managing tables nor foreign keys. 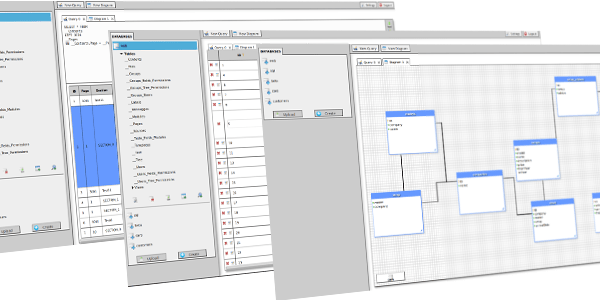 SQLite Workbench is thinked and designed to easy handle diagrams. It is now possible to create diagrams using existing tables, create new tables directly inside diagrams editor, add or remove foreign keys even defining ON DELETE and ON UPDATE actions. Diagrams can also be saved without being executed, allowing to change settings anytime. Without always have to deal with queries SQLite Workbench allows you to edit data directly. Datetime, date, text, numbers are handled with different editors, allowing you to use a simple gui to manage data. Adding/deleting rows is also as easy as a one mouse click, without alway have to deal with Ids. Tables and Views can be created and modified via a simple GUI interface, which let you spare lot of time. TSQL is always enabled, allowing you to perform any query to create/alter/delete/update/select anything manually. It is also possible define custom data types for your data and manage them based on their primitive types. Do you need to use your data for a website or an app and don't want to keep downloading databases? 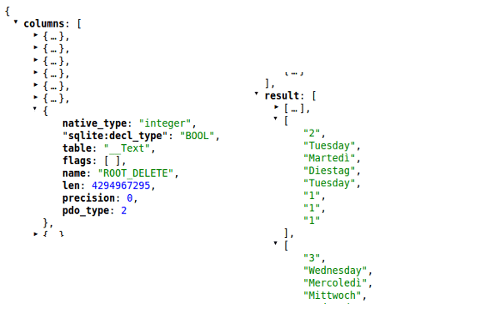 SQLite Workbench provides you an easy API To retrieve your data in JSON or CSV format! Manage your databases throug the online GUI and access/add/modify data through REST commands. Check out our F.A.Q. for more details and usage example.